Government departments and other public sector organizations are constantly under pressure to deliver outstanding services to the thousands of citizens who call annually for information and advice. Yet with budgets regularly being squeezed that’s big a challenge. Red Box Quantify Recording Suite provides state and local government contact centers as well as other public sector organizations with smart, easy-to-use and affordable call recording functionality for record-keeping and improving employee and operational performance. Through listening to and analyzing communications, Quantify helps you identify ways to assess the training needs of employees through workforce optimization, and comply with legislation and call handling standards. By providing target training to employees it’s possible to improve public satisfaction levels and drive efficiencies through increased instances of first call resolution. Plus, because trained agents feel more valued, you can reduce the high cost of employee churn too. Quantify offers the latest innovations in voice, data and call recording in a solution that’s intuitively easy for contact center employees to use. 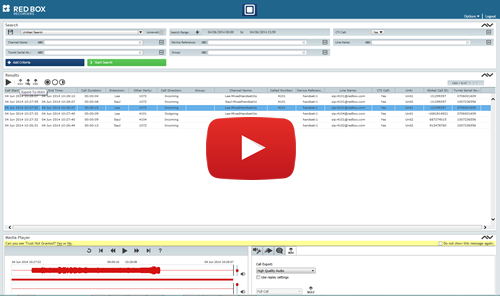 With a host of powerful yet easy-to-use tools for searching for calls, reconstructing incidents and evaluating employees, your teams will be able to get the job done faster and more efficiently. Red Box helps you improve operational performance too while driving down costs. Examine customer interactions in more depth through powerful analytics and make fully informed decisions about how to drive performance yet reduce operational costs. Feel the benefits of Quantify without technical complexity. It’s the voice and data recording industry’s most agile deployment.